Back to School - Pizza Pizza? I Love My Sister and This is Why! Delicious Detox Back at Me! Later today I'm super excited to go to Hamilton's Goodness Me on the mountain to do a cooking demo from 1-3 pm. Of course I'll have to find some time to drive through McMaster University and Westdale, and swing my old running trails in Cootes Paradise. Oh the memories!! Gotta run!! Yippeee! I can't believe I'm on Amazon!! Holidays are around the corner and more people are scooping up Delicious Detox here at the clinic as stocking stuffers, hostess gifts, and more. The love and support from my patients and friends has been wonderful!! Thank you!!!! And to my wonderful designer, Kerri Kenny: I can look at those lemons and pomengranates all day! I was chatting with someone at a meeting on Thursday about anti-aging and she mentioned there was something on CNN that morning about how doing certain things can increase the length of your telomeres (part of your chromosomes) to increase health and longevity. 1. Don't diet (increases cortisol) but eat wisely. 5. Do exercise you enjoy and do it regularly. 8. Hang out with friends. Surprise, surprise.... good diet and lifestyle are key. One of my colleagues, Dugald Seely, in conjuction with CCNM and the Ottawa Regional Cancer Foundation has applied for some funding from Aviva in a competition. My other colleague Shelley Gibbs recently blogged about it... here is the link. I think this a fabulous idea and if you have a chance to vote in the competition take a couple of minutes and follow the aviva link. I usually use sunflower oil in the cast iron pan to cook the pancakes but today I wanted to use coconut oil and it was delicious. It made the pancakes crisp up nicely on the outside and made the pancakes just a little bit sweeter. If you have never used coconut oil in your cooking or baking go out and buy some expeller pressed organic coconut oil (I'm using Spectrum right now). It will be solid at room temperature unless your house is a sauna and then the oil will turn more into a liquid. Coconut oil is a medium chain triglyceride (fancy name for fat) and is super high in lauric acid, which is naturally found in high amounts in breastmilk. It is because of lauric acid that coconut oil has a multitude of benefits including weight loss, heart disease prevention, and immunity, as it is anti-viral and anti-bacterial. Love using coconut oil with my athletes as well. By incorporating coconut oil into their diets, athletes are able to train harder and longer without decreasing their immune system as typically happens with peak training. Yesterday we were sitting reading all the papers as is our Saturday mornings, and I happened upon a little 'musthave' in the National Post's Toronto section about Thai yoga massage. At Zawada Health we currently have 6 massage therapists(2 currently on mat leave), and 1 specifically that does Thai yoga massage. Kelly Yutronkie has been a registered massage therapist for 7 years and has additional certification in Thai yoga massage. The first time I had it done, I wasn't sure what to expect as there were no oils and had my yoga clothes on. It wasn't nap-inducing like a regular massage, it was actually energizing with a twist of relaxation. Kelly stretched me through several rhythmic movements and applied pressure on certain acupressure points or meridians. She guided my body using her own body weight, with arms and legs to enhance the stretch. It's a great cross between massage and yoga AND because it's done by a registered massage therapist at Zawada Health, your benefits will cover it! I love Autumn - for turtlenecks and boots, for big magazine issues of InStyle and Elle, for beautiful leaves turning colours, for soups, and for root vegetables! Friday I bought the October issue of Bon Appetit magazine... the apple torte with breadcrumb-hazelnut crust grabbed my attention as did the headline 'easy fall dinners'. Any kind of apple cake or coffee cake reminds me of all those coffee cakes mom used to make for the workers for coffee break on the farm. We never had dessert after dinner at our house but now that I think about it there were always coffee cakes sitting on the counter. Thank goodness I was active and involved in sports, otherwise I would have been an obese child with the amount of food that was in our house growing up. The Spice Roasted Chickpeas are similar to the ones in Delicious Detox that I made in the snack section. So you spoon the couscous (or in our case quinoa) into a bowl and then spoon the vegetable tagine into the center and then sprinkle the chickpeas over it. While I was making the tagine, I was also making a banana, pumpkin walnut loaf.... I got the recipe from a facebook friend that has this amazing food album on her page. 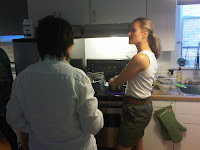 She was kind enough to share the recipe (thanks KLC!) and I decided to of course shake it up and substitute! Here's the recipe with my substitutions in brackets where done! Turned out delicious but when I do it again I would add a bit more ginger and nutmeg or actually get pumpkin spice. Great! In a large bowl, stir together the mashed banana, eggs, oil, pumpkin, honey and sugar. Combine the flour, baking powder, baking soda, salt, pie spice and cinnamon, stir into the banana mixture until just combined. Fold in the walnuts. Pour batter into the prepared pan. Bake at 350 degrees F (175 degrees C) for 60 minutes, or until a toothpick inserted into the center of the loaf comes out clean. Cool loaf in the pan for 10 minutes before moving to a wire rack to cool completely. The last month has been so random with both my schedule and Chris' that I haven't been doing a lot of prep work on the weekends for our weekday meals. We have been buying the minimum on the weekend to get by because there just happened to be only two nights that we would be eating together. The dinners we did have at home together we had quick 'big salad' nights with tons of veggies, and a can of tuna or beans for some protein or a quick veggie stirfry on quinoa. Things that took minimum thinking and time. Last week I was reminded what it was like to cook for one .... I was so tired one night I just sauteed some zucchini and a tomato, threw in some sundried tomatoes in oil, and leftover brown rice pasta and then cracked in 2 eggs. So random but tasty and it only took me 10 minutes total. Today was a beautiful September morning so Chris and I went for a walk through High Park and then had breakfast on Bloor before walking through the Ukrainian festival booths and then home. All the fruit and veggie stands and perogies (even though Ukrainian, not Polish) inspired me to cook this afternoon. So I made parsley pesto, hummus, roasted beets, and a curried lentil stew for the week. It felt good to have a full fridge again! This morning driving to work I saw something that almost made me cry. This little boy, clearly his first day of school ever, had a spiderman backpack and was waiting at the corner for a bus with his mom. It was 8:40 so I thought it was kind of late... so there was a problem. A bus stopped at the lights and I saw the mom walk over to the bus and start talking to the driver. A few minutes later the bus drove off and the little boy threw his backpack on the ground and started crying. Oh boy!!! Poor little guy!!! Hopefully he got to school. Interesting story about Pizza Pizza in the Toronto Sun today. The company has apparently revamped its recipe and portion size ahead of time to meet the stricter healthy guidelines the Ontario government is putting into place for next September: 80% of food sold in schools must be healthy. To achieve the healthiest rating food must have lower levels of salt, sugar and fat, and contain more essential nutrients... and apparently Pizza Pizza has. Great policy. Healthier living and examples of healthy living has to start early!! Still don't like the idea of pizza day or pizza at schools, but if it has to be, then a healthier version is better. I'm never in the Newmarket area but last weekend on my way back from my cooking classes in Port Carling I decided to drive through. Something caught my eye driving down Yonge Street - this huge sign - Natures Emporium. Always up for an adventure and actually having time to wander, I veered off. So impressed! Everything is organic. I walked in and straight ahead was a huge produce section with beautiful dark green leafies - oh the kale and swiss chard!! Off to the right was a prepared section with alot of raw food (surprise!) including a nice looking pizza. I wandered through the bulk section and all the other aisles and came to the cleaning section. The usuals were all there and then I saw dryer balls. I've wanted to try these balls instead of using fabric softener and tried something similar in the past but wasn't impressed. The cute packaging caught my eye (sucker!) so for $19.99 I was the new owner of 2 green funny looking dryer balls. Nellies is a line of non-toxic, hypoallergenic, environmentally friendly cleaning products. The idea behind these pvc-free dryerballs is they lift and separate clothes, moving air efficiently through the dryer. This reduces drying by 15-25%. And because the clothes are not all balled up in a bunch, 10 minutes on medium heat will also push wrinkles right out and help eliminate lint buildup on your clothes. I've used them in 6 loads of laundry so far and so far so good - I love them! nourishtea is a great brand of loose leaf teas. I was flipping through the September issue of tonic magazine this afternoon and came across a Sobeys ad for a Rooibos cooler that caught my eye. Chris, one of the owners of nourishtea, has impressed me with his development of nourishtea and his commitment to charity. Steep the tea in 2 cups of hot water for 15 minutes. Add the two other cups of water, crushed raspberries, and honey. Place in the fridge and chill for 2 hours. add 1 cup of ice to the liquid and garnish with fresh mint. I had so much fun last weekend. 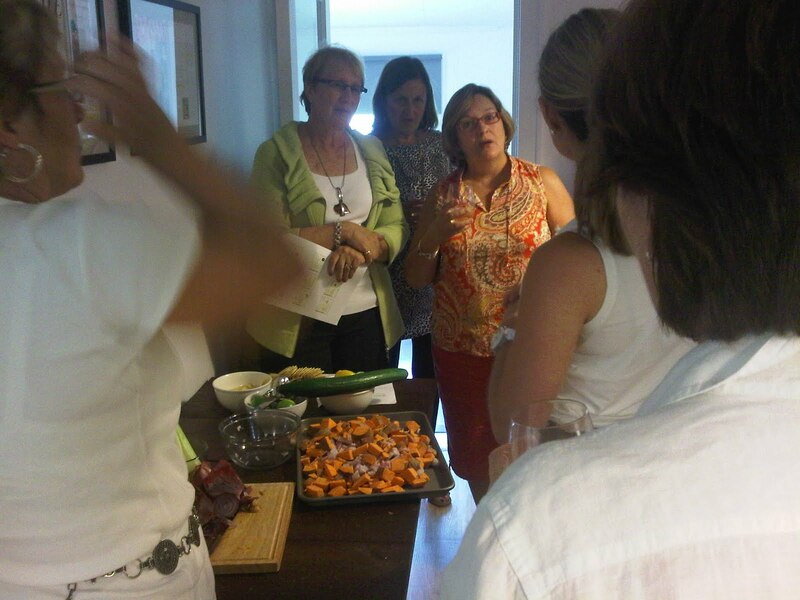 Wellpath Clinic Muskoka hosted a wonderful interactive cooking class and detox seminar, led by ME! We had a fantastic group of ladies help chop up all the veggies and prep for the Warm Spicy Sweet Potato Salad, Quinoa Tabbouleh, and the Almond Chicken. The group munched on the Hummus and Crispbread while I chatted about the importance of detoxification and healthy eating. Wellpath had a great little kitchen for us to cook in and set up work stations and provided wine and beverages for a couple of hours. We all sat down at the end of the class and enjoyed a lovely meal together. Thanks to everyone who made the trip up to Port Carling and to Chelsey and Richard for setting up a lovely space. Well the First Lady does a little cleansing apparently - she needs a copy of Delicious Detox! In an interview in September's Ladies' Home Journal, Michelle Obama mentions that she occasionally takes part in a cleanse. She meant, according to her press office, that she eats as much fruit and vegetables as possible and cuts out fats and oils, dairy, meat, caffeine, sugar and starch for a short period of time. Doing so, she told the magazine, helps "clean out my palate." Well hopefully she has a licenced Naturopathic Doctor looking after her and she is doing these cleanses safely. There are a lot of myths around detoxification. The goal is to decrease the burden on the body. We're surrounded by toxins in today's society - in our food, in our water, in our air, in our cleaning products, etc.... Our bodies can only take so much. I'm a huge fan of giving your body a break - for some this may mean no coffee and alcohol for a weekend, for some it might mean no sugar and coffee and alcohol for a week.... cleaning up shop for a week or two rejuvenates your body, boosts energy, and improves digestion. It is also a great way to kick start new healthy eating habits; and for some it can help in identifying food sensitivities. Detox does not mean calorie restriction - it's about eating clean. The liver needs protein and certain nutrients for the process of detoxification to occur. This isn't for everyone. But what is for everyone is embarking on healthy eating to keep your body working optimally. 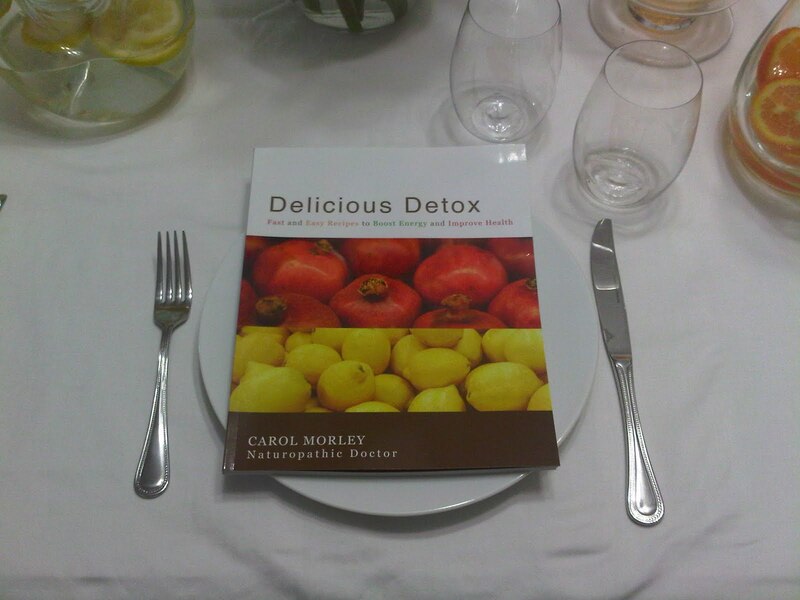 So Michelle Obama if you are reading this, have your people send me a note and I'll send you a copy of my cookbook, Delicious Detox. 80 recipes that are cleanse-friendly, easy to make and most important - delicious!!! Last night there was a desire for something sweet after dinner .... so as usual I starting perusing my cupboards to see if I could make something to satisfy and surprise Chris with. Instead of 2/3 cup melted butter I used 2/3 cup softened coconut oil (it wasn't oil and it was too warm in our house for it to be solid); instead of 2 eggs I used 2 tbsp ground flaxseed simmered in 6 tbsp water; instead of 2 2/3 cup white flour I used 2 cups spelt flour and 2/3 cup quinoa flour. I creamed the coconut oil and flaxseed egg replacement with a little less than 2/3 cup dark brown sugar (I wanted to use agave nectar or honey but thought it would be too liquidy) and then added the flour, a little baking powder and baking soda and a pinch of salt and mixed well. I then added the chocolate chips and I threw in 1/2 cup of shredded coconut. I love using coconut oil lately - it's wonderful in baking and I'm using it more and more in stir-frying and roasting veggies. Yes it is a saturated fat but one that is mostly medium chain triglycerides, meaning that it it chock-full of health benefits: anti-microbial, immune-enhancing, and weight-loss. Last week I was in Winnipeg and decided it was my duty as a Naturopathic Doctor to do some research on a turkish hammam spa. Hydrotherapy is in my scope of practice and detox is definitely one of my specialities. The Hammam at the Ten Spa is a modern reinterpretation of the Turkish Roman hot air bathing ritual. Amazing experience. Turkey is now on my travel list. When my name was called I sat in a robe and pestemal (a large tea towel that is dress code in the hammam) in a tiled heated room to acclimatize to the heat. I was served a traditional bitter and sweet treat that serves to sustain me through my treatment. I had a cup of moroccan mint tea and a turkish delight sweet. After 10 minutes or so I had a quick shower in the heated spa before I proceeded to the aromatic salting area where I self applied salts while seated on a heated bench. I really started sweating now and the salts were very rough at the same time being rejuvenating. Then the fun began. There was a huge heated communal marble slab in the middle of the heated room where I laid down while the hammam attendant rinsed me off with different temperatures of water for the next 60 minutes. During this time there was also a foot and scalp massage ..... ridiculous.... now if this wasn't enough I then proceeded to a private room where I had a traditional soap scrub treatment. For the first 20 minutes I was 'gommaged' - a full body exfoliation with kese, a rough cloth mitt that scoured my pores. I couldn't believe all the dead skin cells!! After the gommage a pure olive oil soap, in some sort of pillowcase that lathered up like crazy, was massaged into my skin. It felt like a feather and I was covered in bubbles. Warm, cool, and then cold water was then used to rinse me off for the next 20 minutes. I then proceeded to the acclimatization room again where I self applied aloe vera gel, and drank and ayran - a salty yogurt drink to replenish. Fridays usually means fish in our house. Today I went to see Tony at Snappers as I do every Friday to pick up some treats. The salmon steaks looked great today so I picked 2 up as well as some fresh Ontario tomatoes, and some broccoli that looked nice and crisp at Fresh and Wild next door. I usually do dill, olive oil, and a touch of sea salt and pepper or lemom pepper and a quick broil for the fish. Today I wanted to shake things up a little and do a quick sauce instead. I did 1 tbsp dijon mustard, 1 tbsp honey, 1 tbsp olive oil and a pinch of sea salt and pepper on the salmon steaks. I put it the oven on broil and wham bam a nice saucy fish dinner. We're also having crunchy broccoli (from Delicious Detox, page 75)and a fresh tomatoe salad (touch of olive oil, balsamic vinegar, and lots of fresh basil). Took me 5 minutes to prepare everything and in 15 minutes we were sitting at the table eating. YUM. Totally forgot I did this piece for the online version of Chatelaine. It's a little interview I did on weekend detoxes. If you haven't checked out the online version of Chatelaine before, toot around the site. I was really impressed with how concise and clean the information is. It's super easy to read, the style blog is great as its short and sweet, and the health section has a couple of good tools including a BMI calculator. 1. On Thursday August 5th in the morning I will be chatting detox with Billie Jo and Jay from 102 ClearFM in Winnipeg. 2. On Thursday August 19th (6 pm), Friday August 20th (noon and 6 pm), and Saturday August 21st (noon) I will be in Port Carling at Wellpath Clinic for a detox seminar and cooking demo. http://www.wellpathclinic.com/img/pdf/Muskoka_CookingClasses.pdf more information. I'll keep you all posted when new appearances are booked. All the best... I'm off to Winnipeg! Anyway I just read a very interesting fact about Ginkgo Biloba. It is an extremely hardy tree that is resistant to pollution and as a result is commonly found in major cities such as New York and Tokyo. So incredibly strong is Ginkgo, that one Ginkgo tree was the only tree to survive at the atomic blast at Hiroshima, Japan. The original therapeutic focus of Ginkgo was on improving circulation to the legs and brain. Later, the neuroprotective effects of Ginkgo were recognized and it became useful for improving cognitive (brain) function in both healthy adults and the elderly. New research indicates that Ginkgo could be of benefit in a wide range of issues such as cardiovascular health, longevity, mood and stress, antioxidant support, eye health, and memory support. It does thin the blood so one must be careful if taking aspirin or warfarin. Although today is grey and rainy outside this recipe on a blog that I follow (Gluten-Free Goddess), caught my eye because of its simplicity. How great to make a few of these and have them in the freezer instead of those heavily artifically flavoured and sugar-laden popsicles or pops. These pops are dairy-free! The recipe uses xantham gum which boosts viscosity and improves the texture of non-dairy ice cream. I prefer not using xantham gum and keeping the pops as simple and "clean" as possible and I used the vanilla rice milk but I'm sure the coconut milk would be divine. Friday I was watching Chuck's Day Off, a show on the Food Network and was intrigued with a recipe for a tortilla - which is essentially a Spanish omelette that traditionally has potatoes and onions. I was also curious because it had smoked mackerel and I've always wanted to look into the health pros and cons of these tasty treat. I know that mackerel, not smoked, is very healthy as it is a fantastic source of omega 3's. When I prescribe an omega 3 supplement to a patient or when I'm critiquing one I always look for one that is made with mackerel, sardine, and/or herring. Smoked mackerel is another story. Smoking fish is a way to preserve fish and keep it as fresh as possible. Smoking fish does not have to be done, but many people like it for the unique flavor it gives fish. Smoked salmon and mackerel are two of the top purchased smoked fish in the country. Smoking fish started years ago when they would preserve the fish in winter to have over a long period of time. Native Americans also believed that if someone handled the salmon the wrong way, it would drive the salmon away from the waters and they would not be able to catch anymore. They would have it served only at their lavish festivals since it was such a delicacy to them. Salmon was highly respected by the Native Americans, Romans, and Greeks. There are a variety of ways salmon can be smoked for example, cold-smoking and hot-smoking. Cold-smoking is cooked slowly for about 24 hours at a low temperature and hot-smoking is cooked at a hotter temperature for less time. Before starting either smoking technique the fish is cured with salt for minutes up to hours. This allows for the fish to let salt in and to kill bacteria while letting some moisture out. After curing the meat it will need to be rinsed off before the smoking process begins. Hot smoked fish can not be cut thin as it will fall apart and crumble. Because of the smoking process the omega 3 content does decrease and there have been studies done that confirms the content of certain carcinogenic (cancer-causing) compounds after smoking fish. One time this was reported was in the September 2004 issue of the Journal of the Science of Food and Agriculture (vol. 84, no. 12,pp. 1545-1552(8)). Consumption of smoked foods and similarly carcinogenic deli meats should be kept to a minimum. Nevertheless here is the recipe of Chuck's Mackerel Tortilla which was delicious and would be a great brunch entertaining centerpiece. 2. Place whole potatoes in saucepan of cold water. Bring to the boil, add a good pinch of salt and cook for about 12 minutes or until just tender. Drain, allow to cool completely and thinly slice. 3. Heat 1 tablespoon of the oil in a 20cm non-stick (oven proof) frying pan over medium heat. Add onion and cook till soft and translucent. About 3- 5 minutes. 4. Add garlic and cook a further 2 minutes, stirring frequently. Continue cooking till onions become a little caramelized and are reduced to ¼ in volume. You don’t want to let anything get too brown. Remove from pan, set aside. 5. Prepare mackerel by peeling the skin off one side and breaking into smallish pieces with your hands. 6. Add the remaining oil to the pan and layer up potato slices, onions and mackerel chunks. Aim for at least 3 or 4 layers. 7. Whisk eggs, cream, salt and pepper in a bowl and pour over the potato, lifting the bottom a little to encourage even distribution. Let cook 2 minutes or so on the burner to get a nice base and start to cook the sides. 8. Place pan in the oven for 25-35 minutes or until browned and cooked through. When it’s ready the edges will be browning, and the top will be puffed up with no signs of runny egg. 9. Placing your serving platter on top, flip the tortilla over, and turn out onto a large round platter and slice into wedges. As many of you know my sister Angela owns Moksha Yoga Edmonton (MYE) and Moksha Yoga South Edmonton (opens Monday!!! Yay Ang!!!) and is a fabulous yoga instructor. CTV recently did a story on how the Edmonton Eskimos are going to MYE for some tough love in the yoga studio. Here's a clip of the piece that was recently posted by TSN. Ang is instructing the class. Way to make them sweat Ang!!! http://www.tsn.ca/cfl/ - If you look to the right column, the story is called "Hitting the Mat". If you've never tried Moksha I urge you to give it a try. I've been doing it since its 'birth' around 2004 and prior to that I was doing Bikram Yoga, which is also a yoga sequence done in the heat. It's improved my running, my overall health and energy, and most of all it has given me the gift of learning how to relax and finding calm in my hectic life. Namaste. Every year I get the same questions right about now about sunscreens. More and more people are hearing about the chemicals in most sunscreens and are more reluctant to be applying them on themselves, AND even more so their kids. My husband burns very quickly. He's like a beacon of red light after a short walk outside but has always been very good with applying sunscreen and wearing a hat. I don't burn too quickly but have noticed over the years that the sun is way more intense than it ever has been. I remember the good ole' days on the farm, hoeing the rows of tobacco in a bathing suit, no hat, no sunscreen, or sitting on the riding lawn mower, again with no sunscreen .... my how things have changed. I wish I knew back then what I know now about how dangerous the sun is (other than the vitamin D it supplies!) AND more importantly how it ages you! Look for more information on these tips in the Zawada Health June newsletter which will be posted on the website (www.zawadahealth.com) later this afternoon! This week has been one of those crazy crazy crazy weeks. After a short but amazing weekend getaway to NYC, and a long LONG flight home (we left 12 hours late because American Airlines oversold the flight), it was a week of catch-up. An intense schedule of patients, a board of governors meeting and CCNM graduation on Friday (congratulations Claire! ), all made me so grateful the weekend came quick. Thank goodness for some frozen soup in the freezer (thanks mom!) and a wonderful husband who did some key fruit and veggie groceries! It was also one of those weeks where I heard or read the same story 4 or 5 times which of course made me want to blog about it. I had a new patient this week that was referred by another one of my patients (SM) who has really embraced healthy living. She told me about an eco-party that my patient hosted earlier this year that really taught her a lot and opened her eyes to options. 8 friends all went to Toronto's Green Living Show for the day and then went to SM's place where she made quinoa (no one had tried it! ), they then made all-natural cleaning supplies and soap, and then everyone got a little goody bag with some ground flaxseed and information about healthy living. How amazing! This is truly an inspiring party that anyone can imitate! I also picked up the June issue of Tonic, a healthy monthly paper always filled with great tips and stories. One of the stories was how to throw a green party. Their tips were a little different - most of the tips being about how to throw a eco-friendly party like sending evites instead of paper, using veggie or herbs to decorate, using soy and beeswax candles instead of paraffin and planning a local and organic menu. Too scared to try eating ferns? The fiddleheads in grocery stores right now are still fresh. Buy and eat them soon as the season is closing up. Friday night I wanted to make some pesto (Parsley Pesto from page 88 in Delicious Detox) but didn't have quite enough parsley. The only other green thing I had in my fridge that was a potential addition was a bag of fiddleheads that I bought a few days earlier. So I carefully washed the fiddleheads, brought a pot of salted water to a boil and then cooked the fiddleheads for 10 minutes. I dumped them in ice cold water afterwards so they would preserve their beautiful green colour and set them aside. I then turned my attention to the parsley pesto. I processed the garlic, sea salt, and walnuts and then added the parsley I had and half of the fiddleheads (1 cup) I just cooked. I whizzed it around and then slowly added the olive oil. Beautiful. I ended up putting the pesto on 2 fillets of rainbow trout (yes it's fish fridays at our house!) and then sauteing the rest of the fiddleheads with a red pepper and leftover broccoli, added some dried thyme and parsley and bam - dinner was done and was a hit! Fiddleheads need to be thoroughly washed and cooked completely before eating. They can be used in any recipe where asparagus is used as they are quite similar. Love this. I love this because I used to be a spinning instructor and can appreciate how difficult it is to motivate people to get on those bikes and keep spinning hard to get a great workout. I read about this in the Globe and Mail earlier in the week and just remembered I wanted to check it out. So this company, Green Revolution Inc., has created this technology to attach to spinning bikes that creates electricity to feed back into the spinning facility! The company's mission is to involve people in the process of creating clean renewable energy from human activity. Now while people are getting a great workout, they can also have a positive impact on the environment by creating clean electricity that reduces greenhouse gas emissions and helps to connect a healthy body with a healthy planet. Can you imagine if the class participants weren't working hard enough during the workout and the lights started to flicker and shut off? Ha! There is a clinic in Toronto (Avenue and Bloor) that opened up in September 2008 that just opened up a new location in Port Carling that I had to share. The website is great... very informative, simple and easy to read and professional. Two naturopathic doctors are available for a variety of services - Dr. Porter and Dr. Campitelli. If you scroll down the events in Port Carling you'll see that I'll be doing an appearance in Port Carling with my new healthy cookbook - Delicious Detox. The date is still tba but keep checking! Essentially I agreed with the story. I do find a lot of people come in and say they are allergic to milk or wheat or corn etc... however in reality these people probably have food intolerances or sensitivities. If a food allergy occurs, symptoms would be swollen lips, or itchy throat or lips, or a feeling of throat closing - an anaphylactic response. Food intolerances or sensitivities express themselves in a variety of ways that may include: heartburn, bloating, headaches, joint pain, etc. Sometimes I will do a IgG Blood Spot test at the clinic to see what foods the person is reacting to, causing a food sensitivity. This just involves a quick finger prick test and 96 potential foods are tested. Alternately I will do a food challenge or elimination diet to see which foods may be causing a problem. Last night my colleague and good friend Shelley Gibbs, went out for dinner to Raw Aura in Mississauga. The raw restaurant catered my Christmas Zawada Health party and I've been a couple times on my own and have never been disappointed. Last night was no exception. Normally on a restaurant menu I wouldn't even dare look at a 'mac n'cheese' item but since the 'mac' was zucchini and yams and 'cheese' was a cashew nut concoction I decided to go for it! Shelley had the lasagna which was mostly zucchini noodles with the same cashew 'cheese' and a walnut pesto on top. The lasagna is one of my faves. We finished off the meal with a lemon avocado cheesecake which was nice and light. We were talking about tweeting and I told Shelley I would be an awful tweeter because I am so long winded but I thought she would be great because she always has something smart to say or sarcastic and has some great little one-liners. Anyway she informed me she's been doing a blog... so I just checked it out and of course I'm not surprised that it is wonderful. Great info Shelley! This is going to be a strange blog post but I had to share. If anything I'm sure anyone reading this will get a good laugh. This is an email copy and pasted straight from my sister Angela. I sent her a copy of my cookbook, Delicious Detox a few weeks ago and she has finally set aside the time to do the exact detox outlined in the book. She was determined to follow the 14 day meal planner and the accompanying grocery list. We talked on the phone earlier today and she was excited about going to the grocery store. So I asked for her to email or call me after her grocery shopping so I could get her thoughts on the way I organized the shopping list and to see if there were any difficulties. Ang has probably done 3 or 4 detoxes in the last 5 years under my guidance but being a busy busy woman she usually defaults to plain brown rice and quinoa, basic chicken and fish, and easy stir-frys. "Start time - 3:10pm- started with veggies and fresh herbs. Felt all over the map in the grocery store :) Wondered where I should start. I should've brought a pen to check things off the shopping list (mental note for next time) Oh and suggestion Carol- please make a tear out list next time!! lululemon adventure at the mall today! I feel like I'm on a scavenger hunt hahaha. What's the difference between english cucumber and non english? lemons as I have a lot at home. Oh no... No fresh blueberries... Blackberries are in season so I'm getting those instead - a little modification! 3:40pm - done fruits moving onto nuts! Raw vs blanched? I don't know u tell me?!?!? Oh whoa.... I almost picked up a jar of nutella instead of tahini. Ha! Gotta watch that... Carol wouldn't approve. Whole black pepper vs whole black peppercorns? Is there a difference? Don't worry I got peppercorns but just want to know! amaranth? I'm going to have to ask someone. I should've went to the other grocery store because they have a health food section and this one doesn't -- this isn't going to be a one stop shop for this detox ...Mental note that too! The lady now tells me that rainbow trout doesn't come in fillets because their so small ... Really? I told her my sister made this cookbook so she should know! crazy but not a fan of this not being a one stop shop! 4:20pm- Ok I'm done and now to the check out! Stay tuned! Would've taken my a lot less time but I had to email going through the aisles! YES YES YES this is the greatest news ever! Ok that's all for now. Hope you enjoyed my play by play." Hilarious. I love it. She has such an amazing zest for life and has kept me laughing over the years. I could feel her stress going through the grocery store. Doing a detox isn't easy and it does take a lot of preparation. But this short term pain in getting proper groceries and having a stocked pantry and prepping some foods will bring such great rewards. Doing this will save her the daily stress of not having foods around or meals prepped or being hungry. Ang has set herself up for success! This was a great reminder for me on what the majority of people go through when I put them on a detox. Love you Ang!!! Oh wow Saturday night was fun and surprising! Chris and I went over to our friends Anne-Marie and Dave's house for dinner (Nor and Kris joined us as well!) on Saturday. The 6 of us always have a great time together and this time was no different. As we sat down for dinner and the first course - a soup - was being served I was impressed. This soup was delicious... very familiar.... Hmmmmm.... it was my Squash Soup recipe from the cookbook I realized!! How fantastic! Anne-Marie and Dave decided to cook us a feast from Delicious Detox. I'm attaching the Crunchy Broccoli recipe straight from the cookbook, as it is definitely a fan favourite among many patients (and practitioners at the clinic). Mom was always right in making you eat your broccoli! It truly is a super food, filled with vitamins C and A and folic acid. A serving of broccoli contains almost as much calcium as a glass of milk! You can save the broccoli stalks trimmed from the florets in this recipe and use them in a soup or stock. 2. Cut the broccoli into bite-sized florets and soak in a bowl of water for 5 minutes. 3. Drain the water from the bowl and add the flaxseed, sesame seeds, olive oil, salt, and pepper and mix thoroughly. 4. Place the mixture on a baking sheet and bake in the oven for 15 minutes. Looks like she's from Australia. Anyway just leafing through I was really impressed and haven't seen a resource like this. Oh and if you haven't had a chance to pick up my cookbook yet, Delicious Detox is on sale now! You can come to the clinic to pick it up, or buy it online on our shop online section at www.zawadahealth.com. I'll post something when the cookbook's official website goes live. Bookmark www.deliciousdetoxcookbook.com. What a beautiful day. I have to always remind myself that I did not grow up in the city and that I have to return to my roots more often and take in the country air. With my parents not living in Tillsonburg anymore there is really no reason for me to drive out that way very often. I love the Spring air in the country, with the tractors out, getting the fields ready for planting ... it nourished my soul. My colleague and friend Auromira Banga is a naturopathic doctor and busy mom in the UK. Here is an interesting post from her blog today that may give you a better sense of all the things running around in our heads as naturopathic doctors. Yes we are primary care practitioners and we can do physical exams and pap smears and prostate exams and in British Columbia our scope has increased to be able to prescribe a list of pharmaceuticals like antibiotics.... but we also are always looking at the whole person and everything that is going on in their life that could be contributing to their health concerns. We have a lot of different tools in our tool belt including herbs, homeopathy, nutrition, and of course Chinese medicine to treat an individual. In Chinese medicine each season has a different organ associated with it and Spring is associated with the liver and gallbladder. And this is where Auromira's blog post comes into play. So when I'm looking at someone and trying to figure out (like a detective!) what is going on, not only do I look at their physical symptoms from a conventional perspective I'm also looking at their personality and characteristics and how they react to stress..... It really truly is a holistic approach. Love it. Last night we watched Food Inc. on CBC. I had seen parts of it in the past but never the whole thing at once. Definitely worthwhile to take a look where our food really comes from and how the big food companies shape how the majority of society eats. What made me really sad was an interview with a family that was eating $1.00 burgers for dinner because they couldn't afford much more. They were pictured in the grocery store, wanting to buy fruits and vegetables but foregoing them because they were too expensive. I really wanted to call them up and say you can eat healthy on a budget. At least once a week at the clinic I have patients that say they can't afford to eat healthy. I think a lot of people think it is expensive to eat healthy because they associate healthy with organic. Eating healthy can mean a lot of different things to different people but it comes down to eating clean and as close to the original food as possible i.e. the grain instead of bread or an apple instead of a 'fruit-to-go'. Yes I know that some fruits and vegetables are pricey, especially out of season, but some are very affordable. Cabbage, carrots, apples are just some examples of less expensive yet healthy foods. What about rice? What about beans? As a society we want convenience so packaged foods are easy to buy for many people. "Organic" packaged foods are ridiculously expensive... these aren't necessarily healthy. Still in a box! If we all attempted to cook more, making creative meals out of basic food staples that aren't expensive, eating healthy on a budget becomes a reality. After the excitement of having my cookbook (Delicious Detox) finally in my hands on Friday, I went to a wonderful seminar on Saturday and Sunday on common pediatric or childhood health concerns. It was a good review of my third year pediatrics course but introducing some new concepts on treating childhood ailments with drainage remedies and homeopathy. One concern that I see at least once a week is chronic ear infections in children. Parents will bring their little ones in because they've had a few ear infections in a short amount of time and their medical doctor wants to put tubes in their ears. So I'm usually the last option before this stage. It's wonderful because naturopathic medicine has so much to offer when it comes to treating ear infections acutely or if the child has a chronic problem. The first thing I usually do is take the child off dairy for at least a month along with some other tricks of the trade like probiotics. Any naturopathic doctor will usually eliminate one of four common food allergens - dairy, wheat, sugar or soy. The one thing that surprised me the most in the discussion of this topic was that even the American Pediatric Association knows otitis media (ear infections) is an immune reaction of the body typically to a food intolerance. There was an article in their journal in 1995. Elimination of these foods addresses about 90% of ear infections! So why do pediatricians or family medical doctors never mention this to parents as a first line? Fiber, fiber, fiber.... what do you most people think of when they hear the word fiber? Good bowels so decreased constipation! Decrease in risk of colon cancer and diabetes! Lowers risk of heart disease! Why fiber for weight loss? Fiber helps you feel full sooner, while it also slows down your rate of digestion, keeping you feeling full longer. It also moves fat through your digestive system faster, which means less fat is absorbed. Women should try to get over 20 grams of fiber in their diet a day, while men should strive for over 30 grams. Just to give you an idea... an medium sized apple with the skin on has about 4 grams of fiber as does a cup of cooked spinach while 100 grams of cooked black eyed beans has 7 grams of fiber. Once in a while try to write down what you had during a day and check with the many different fiber charts online to see how much fiber you are getting! Alternatively give me your diet diary and I'll check your fiber levels as well as calcium and iron and protein in your typical day... most people are pretty surprised how little their levels of these nutrients they are consuming! A study in the Journal of Pediatrics published on Monday revealed that breastfeeding exclusively in the first 6 months of life would save 1000 lives and billions of dollars. Specifically in the US, 911 preventable deaths and $13 billion dollars. Researchers included the cost of health care as well as parents time away from work. The World Health Organization says infants should be exclusively breastfed for the first six months of life "to achieve optimal growth, development and health." The American College of Obstetricians and Gynecologists, the American Academy of Pediatrics, the American Academy of Family Physicians and the Centers for Disease Control and Prevention all agree that breast milk alone is sufficient for newborns and infants until they are 6 months old. Nearly 95% are due to premature deaths because of SIDs (sudden infant death syndrome), lower respiratory infections like pneumonia, and necrotizing enterolitis (intestinal walls die). Breastfeeding has been shown to decrease the risk of these illnesses as well as 7 other. A lot of contributing factors were discussed by the researchers such as lack of education in hospitals, pressure from grandparents and parents to stop breastfeeding when it's not going well (because they grew up in a 'formula' time), and a delay in immediate skin-to-skin contact between mother and baby making it harder for the baby to develop its sucking instinct. What a beautiful weekend! I went for a run yesterday morning and then Chris and I walked through High Park to enjoy the mid-day sun. Today we went to some of our favourite places in Toronto including St. Lawrence market and Kensington market to pick up some things for Easter! I had to stop in to Urban Herbivore for a apple cranberry spelt muffin too.... delicious.... some weekends I think of ways how I can incorporate a trip there with other errands I have to do. This afternoon I went for another run followed by a great little 20 minute yoga session in my room. Some mornings I`m crunched for time to get to moksha or it`s raining outside so I`ll listen to one of the 15 or so yoga downloads I have from either itunes or my sister, the best yoga teacher ever :) and do an hour session in my room or a quick 20 minute power yoga. This is a great little tip for those crunched for time in the morning or those looking for little ways to get some exercise into their daily life. Now if you`ve never done yoga before this isn`t going to work for you as I recommend that you start off in a studio until you feel comfortable with the postures. You could also work on a yoga dvd to get into the flow of things before you work your way into an audio version. I remember there was a time when I thought the longer I spent in the gym the better. Oh those McMaster days..... As I get older, I`m wiser, (and busier), and realize that even if I do something small everyday I can stay on track and be fit. Of course this doesn`t work great if you are training for something, but for general health and wellness this is perfect. Whether it`s getting up 5 minutes earlier and skipping rope, or doing 5 minutes of jumping jacks and pushups, every little bit counts! Love this. Researchers from the University of Illinois recently found that brain cognition significantly improved after 20 minutes of brisk walking in pre-adolescent children. Taking frequent short breaks while studying or focusing on a project is important for everyone. So next time your kids (or you!) want help studying for a big test at school urge them to grab their sneakers and go for a short walk! Pleasantly surprised by a patient yesterday who told me their MD(medical doctor) told them to take folic acid and vitamin D for their cervical dysplasia before returning for a follow-up Pap smear! Of course as an ND (naturopathic doctor), that would be at the top of my list when a woman comes to me with an irregular Pap smear result, along with nutrition and lifestyle changes. What exactly is dysplasia and what does a Pap smear do? A Pap smear takes a sampling the cells on an area of the cervix and then these cells are looked at with a microscope to determine their abnormality or if it is cancer. Dysplasia just means cellular changes. Dysplasia is a great example of what preventative medicine can do, because in almost all cases it is a preventable disease. The HPV (human papillomavirus) causes virtually all cases and this virus is sexually transmitted. Many co-factors serve as 'co-carcinogens' in the development of the cellular changes such as smoking, nutrient deficiencies, oral contraceptive use, and immune deficiency. This is where ND's are fabulous. We can advise patients about what they can do about these cofactors. I went to visit my parents this past Sunday for a quick lunch and some shopping. It was great to see them as usual and of course come back with some food for the week! I was really surprised at the beets mom made for lunch. Instead of the standard, she sauteed some onions and then added cumin, cinnamon, and nutmeg before adding the beets, horseradish, and lemon juice. She cooked it all together for half an hour or so and then bam... done... it was delicious. Of course in true mom style, when I asked her for the recipe she stared at me blankly and just said, "oh you know, to taste." Anyway... just had some leftover beets for lunch and they were even better today then they were on Sunday! The next trick will be Easter Sunday when I will attempt to make mom's borscht. My parents are off to Edmonton for a little road trip to visit my sister so it's just going to be Chris and I for Easter this year! She refused to write down the recipe of course so quickly explained and I'm supposed to go from there! We'll see how it goes.... I will not be reporting on this however as it this meal will not be suitable for a naturopathic blog. Can anyone say kielbasa? I'm just about to leave to visit with a group of university friends. 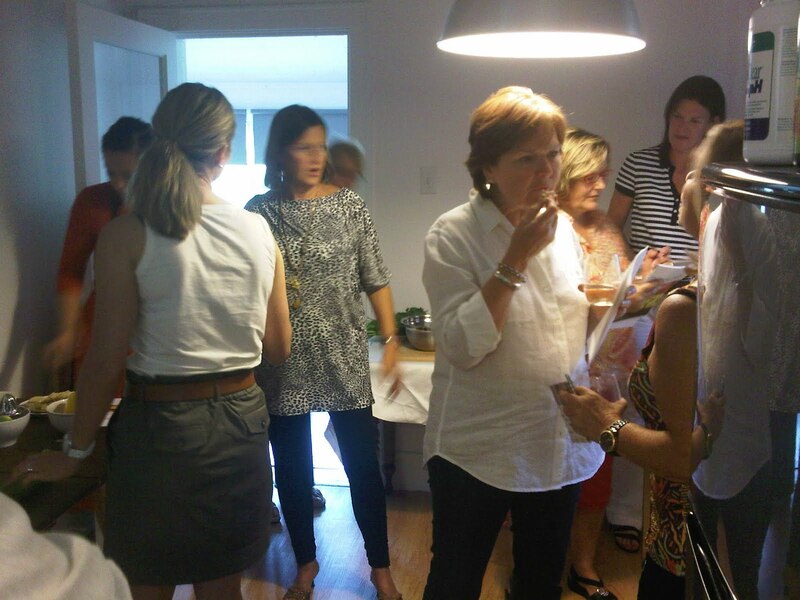 We're all meeting at Lisa's house and each of us offered to bring a side dish or dessert to make up the meal. I'm bringing kale. Not sure if Noreen, Lisa, Cindy, or Stacey has ever had kale but this will be a good opportunity for them to try it.... I was downtown today so I went to Whole Foods to buy some beautiful organic kale. They had 4 or 5 varieties so I went with the dinosaur kale which is thinner, darker, and not as leafy as the other variety I bought. I washed and cut the kale into strips and then steamed it for 3 minutes. While it was steaming I quickly blended 2 tbsp of tahini, 2 tbsp braggs (pure soy sauce), and 1 1/2 tbsp of honey. It seemed a bit thick today so I added a tsp of water to thin it out a bit and then poured it on top of the kale and mixed it all together. I sprinkled 2 tbsp of sesame seeds and did a final quick mix. We made a delicious vegan paella tonight for dinner. The recipe is from Voluptous Vegan, a fantastic cookbook that caters to entertaining vegan. It is organized in full menus with side dishes and everything. The recipes are not quick, as they involve a few steps but are definitely rewarding. I think I've blogged about this before as I've made this recipe a few times. Aioli is a garlicky mayonnaise that contains eggs. In this version, tofu is the base. Sometimes I make this aioli as a dipping sauce for sweet potato fries instead of using mayo. Roast the garlic in the oven for 30 minutes at 375 F drizzing some olive oil and sea salt on the garlic before wrapping it up in foil. Afterwards in a food processor, combine the other ingredients and pulse. Squeeze the roasted garlic out of the skins and then add to the tofu mixture and puree until creamy. Eating junk food during pregnancy may raise the chance of having obese children who are more susceptible to diabetes. Researchers at Royal Veterinary College fed female rats doughnuts, muffins, chocolate, potato chips, cheese, cookies and candy during pregnancy, and noted that the offspring of these rats were fatter, had more muscle waste, and showed signs of insulin resistance -- a precursor to type 2 diabetes -- when compared to control groups. Another interesting tidbit I heard on 680 AM news (but I haven't been able to find the study) is that eating junk food prior to conceiving increases the chances of having a boy versus a girl. Huh? Really? Ok let me just put this out there to all my patients or patients-to-be.... You won't win the diet and lifestyle questioning with me. Try it with your medical doctor or your friends or anyone else that tells you to 'eat more veggies' or 'exercise more' for better health. me: how many times a week do you do any formal exercise? me: like once or twice? patient: well I'm not consistent but... do YOU exercise every week? me: actually I do; I try for everyday but definitely 5x/week I do something formal. Or then the conversation turns to food so I inevitably get asked: Do YOU eat this way? Do YOU eat kale? So YOU NEVER have sandwiches for lunch? or YOU NEVER have deli meat? And so this week, after 7 years I finally said to a patient that these questions will never work with me because I actually practise what I preach and I value each and every thing that I suggest to a patient. It's not just about treating a health concern like high blood pressure or high cholesterol but it's just good preventative medicine to eat well and exercise. DISCLAIMER: I'm not perfect. And if my husband Chris reads this then I risk him commenting on this blog about the martini I had last weekend or the ice cream scoops that are sneaked in here and there or my mom's perogies that found their way out of the freezer and onto my plate for lunch on Sunday. Gotta love McMaster! Ok maybe I'm a bit biased because I spent 4 wonderful years there but their research teams are really amazing. Just read about an interesting study they are doing with supplements - including green tea extract, melatonin and a bunch more - that might be able to stave off old age. The supplements are being found to tackle the key mechanisms of aging when combined (not individually), at least for some lucky mice in the study. The idea is to slow down aging and therefore slow down some degenerative conditions, not prevent them. These lucky mice on the 'anti-aging cocktail' were young and spry like 20 year olds instead of their true '80 year old' age. The researchers found that the supplements were actually affecting their mitochondria (energy production centers), producing fewer free radicals. There was even a cricket that died after 257 days instead of living the usual 120 days! David Rollo, the chief researcher, said they are seeing a 10% life extension in mice which would mean 10-15 years in a human. The supplement cocktails includes: vitamins B1,B3,B6,B12,C,D,E, and chromium and folic acid, garlic, ginger, green tea extract, l-glutathione, melatonin, selenium, cod liver oil, coenzyme Q10, and flaxseed oil among about 15 others! More and more reasons to take care of yourself, eat well, and take some key supplements, which have been individually prescribed by your Naturopathic Doctor.